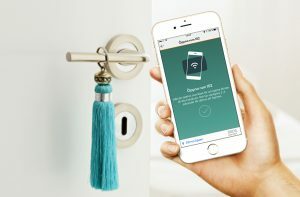 Stockholm – June 14, 2017 – Thomas Cook Northern Europe, a hotel and travel group with tour operators in Scandinavia, including Ving in Sweden and Norway, Spies in Denmark and Tjaereborg in Finland, is announcing the implementation of ASSA ABLOY Hospitality Mobile Access at its concept hotel, Ocean Beach Club, on the Greek island of Crete. Guests staying at the hotel this summer will now be able to use this innovative technology to access guest rooms using their smartphones. The mobile access solution will significantly improve the guest experience, as they will no longer have to queue up for check in at the front desk when they arrive. Guest’s smartphones become their room keys, allowing them instant access and the ability to start their holiday immediately. The first guests who signed up for the key test arrived at the Ocean Beach Club Crete in late May. They received their mobile keys a few days before check-in through an app on their phones, and were able to follow the property map within the app to find their room and quickly make themselves at home. The technology for the mobile keys is included in the ASSA ABLOY Hospitality Mobile Access solution and is implemented in their app, which is available for both iOS and Android. “We have seen global interest in mobile access solutions significantly increase and are excited to be doing this implementation with Thomas Cook Northern Europe. The mobile keys give staff more time to focus on the guests, making their holiday experience the best possible,” says Markus Boberg, SVP Commercial Excellence. For more information on ASSA ABLOY Hospitality Mobile Access and its other innovative technologies, please click here.